A train journey across the Tibetan High Plateau to Lhasa. My train arrived in Lhasa around 6.00 p.m. after a 29 hour, 2188 km journey across the Tibetan Plateau. I was to stay in Lhasa for two days, leaving by plane in the afternoon of the second day. 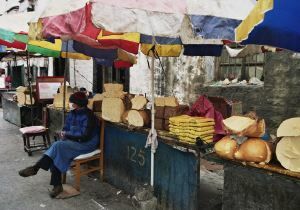 My hotel was near the centre of Lhasa, but the surrounding streets were no different to those in many cities in China. However, in venturing out in the morning to Tibetan places of interest it quickly became apparent how important Buddhism is to the Tibetan people and that Lhasa is the heart of Tibetan Buddhism. 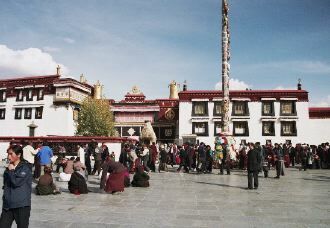 Apart from the many saffron garbed monks, there were throngs of pilgrims who were obviously visitors to Lhasa. The Jokhang Temple, Tibetan Buddhism's holiest shrine. 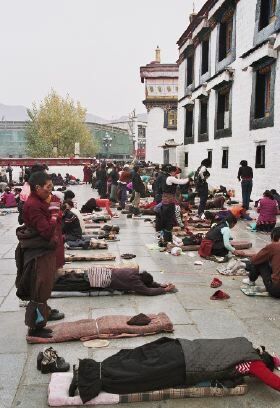 Pilgrims prostrate themselves in front of the Jokhang Temple. 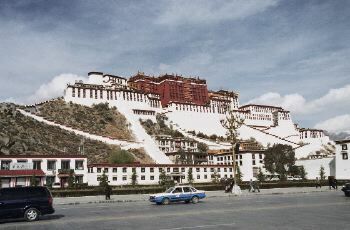 The Potala Palace, residence of the Dalai Lamas. It is possible to take a self-guided tour through the Potala Palace. However, to reach the rooms along the top of the hill it is necessary to walk from street level up the long steps. This can be a breath-taking experience in the thin atmosphere. 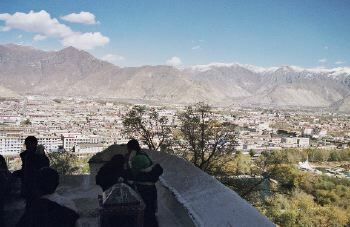 Looking east from the Potala Palace over the centre of Lhasa. 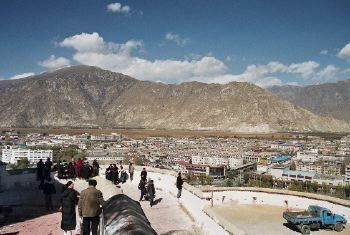 Looking south from the Potala Palace, the Lhasa River can be seen at the base of the mountains. 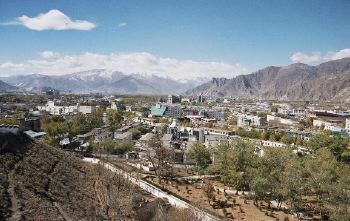 Looking west from the Potala Palace towards the more rural end of town. It is difficult to get a firm figure for the population of Lhasa, but 400,000 seems to be of the right order. 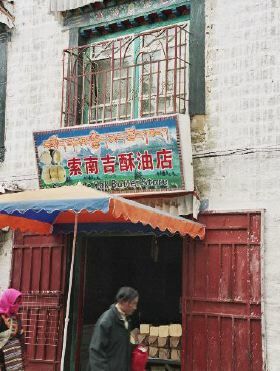 It is equally difficult to establish what proportion of Lhasa's population is Chinese. Locals believe it is the order of 50%. 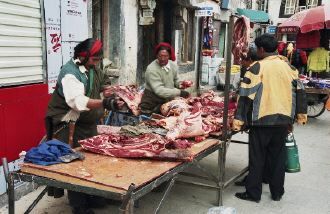 An open-air butcher shop with yak meat and rib cages on sale. As the sign in English says "Yak Butter Store". As a bit of light-hearted sight-seeing I took a 1.5 hour car trip into the countryside north of Lhasa to a hot springs. 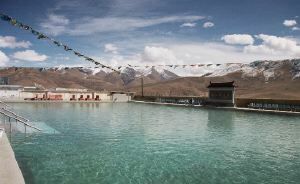 To my surprise I found an open-air swimming pool with a sign saying the altitude was 4500 m. I found myself swimming in water that was almost too hot. It was a crazy experience. Near the swimming complex was a geothermal plant. 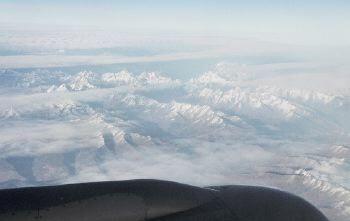 I left Lhasa by plane flying east towards Shanghai. Initially we cruised above cloud, but when the cloud opened up we were flying over the incredibly rugged countryside between Tibet and Sichuan Province. This was the end of my exciting adventure of a train journey to Lhasa on the highest railway in the world. An adventure which won't be forgotten in a hurry. From this day-long train journey across the Tibetan Plateau it was possible to make tentative observations about the environmental impact of the railway and the possible impact of global warming on the railway. Also out stay in Lhasa fostered thoughts about the railways effect on the Tibetan way of life. These observations are explored on a separate page.